Recently a friend of mine decided to host a "Clutter Intervention." The idea is to eliminate an item everyday for forty days (she is calling it 40 for 40). In forty days the group will get together each bringing their pile of items. There will be an opportunity to pick through everyone else's pile before the items are donated to Wendat. I thought this was a great idea but then realized that I have downsized so much over the years that I don't think I have forty extra items on the bus. So I put the idea out of my head thinking I had no clutter left. But over the next couple of days I found myself assessing each item I had and asking myself if I really needed it. I was also looking at my overhead cupboards realizing how rarely I open some of them. Surely there are items behind those doors that I am not using. With that thought I decided to go through the bus over the next few days and see what I could find. I was shocked at how much I found in this tiny eighty square foot bus that I really don't need or even use! I started looking in the overhead cupboard that I open the least and found nineteen clothing items just in that one area! I started to get excited thinking this was going to be easy! As I sorted though the rest of my "stuff spaces" I found a few more items and managed to collect thirty two things just from our living space (not the storage space under the bed)! 40 for 40 turned into a one day event as I am sure I can come up with at least eight items that I am not using in the storage area under the bed. I honestly didn't think I would be able to participate in this and if I can find this much extra in my tiny short bus I bet you could look around and host your own clutter intervention. Top 8 Places to Park at Night. 1.We never stay in the same spot two nights in a row and hang out in different places during the day. 2.We clean up after ourselves and follow all leave no trace principles. 3. We follow our guts. If something doesn't feel right about the spot we don't stay. 1. Parks or wooded areas. This includes forest service roads on the edge of town, conservancy areas or historical sites. Anywhere with an awesome view or that is naturally sheltered is our favourite. Most of these places are also perfect for walking the dogs. 2. Tourist Information parking lots. We look like we belong here. 3. Mall, Grocery store or Wal-Mart parking lots. This is my least favourite but sometimes the most convenient. 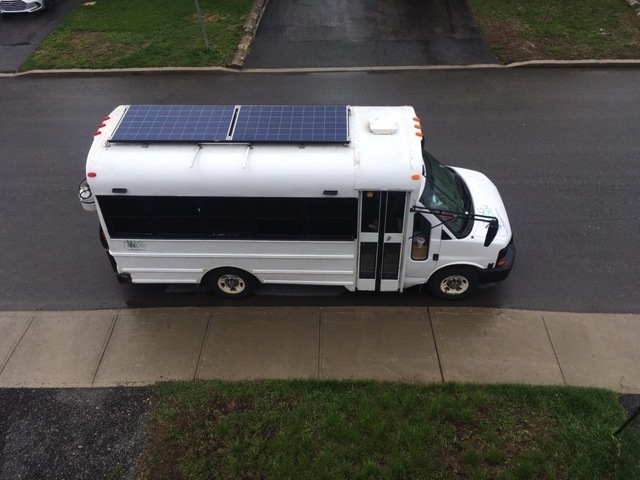 We usually look for the darkest corner away from traffic to park but recently learned that our solar panels will continue to collect power if we park right under a light post. Especially on days when you need to refill your propane tank and/or get gas. 5. Recreational Centres, Arenas or the YMCA. Sometimes you can even grab a shower! This is perfect for the nights where it's really snowing and you need to be out of the way of the snowplows. MEC, Sail, Sojourns, Cabellas, Bass Pro, or any fish and tackle shop. The bus just looks like it's supposed to be there. Because we have a logo on our bus that pertains to dogs we fit right in and go unnoticed when parked in front of a pet store or a dog park. Hope this gives you a few new ideas about where to park for the night. How to Live on a Bus in Winter. After living out of a backpack for five months coming home to the bus felt like a luxury! The seemingly endless propane to cook and heat up with and the giant water tanks compared to my small water bottles make my eighty square foot bus feel like a palace when compared to my hammock. Even though it is now winter in Canada the bus is so much warmer than sleeping in California in the desert. Michael had insulated and covered over all the windows (including the back door) with styrofoam and plywood and added underlay and a carpet over the hardwood floor for the winter before I came home. I much prefer the 360 degree view that all of the windows offer but realize that it's more important to be warm. 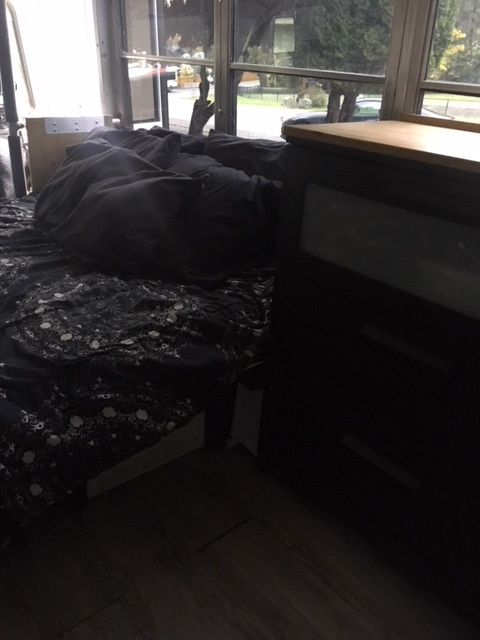 It's also been handy being able to open the back door to access the under the bed storage area from outside without having to worry about making the inside of the bus cold. 2. Cover the front windows at night. In the past we have used an insulated sunshade on the windshield at night along with a thick wool blanket over our passenger door along with another thick blanket that separates the driver area from the living space. This worked well but this winter we decided to try to use all the space in the bus as living space. This winter we are using cheap bamboo beach mats that are lined with a thin silver layer on one side. I bought them last spring from a dollar store hoping they would work to cover any remaining windows this winter. They work great! We hang two of them from clips from the overhead wall on the front of the bus and they are long enough to go right to the floor. The third one we hang over the passenger door. Not only does this keep the warmth in and the cold out but the light reflecting off.of the silver layer really brightens up the bus at night. We use a spare pillow in the stairwell and cover it over with a board insulating the stairs and creating a few more feet of usable floor space at night. By far this is the coldest area of the bus and the hardest to keep warm but this year it doesn't seem as cold using the beach mat over the door. We are still using our Mr. Buddy heater we bought a few years ago. Because we remodeled the bus it can no longer be permanently mounted to the back door. Instead we have to detach the propane hose from the stove in order to use the heater (which is a bit of a nuisance) but now the heater is in the middle of the bus where it heats up the entire bus quickly even on the low heat setting. Just remember that if you choose to use this method of heat you need to make sure you have a working carbon monoxide detector near your heater as well as some.method of air exchange. We just leave the driver side window down a crack and that allows enough of an air exchange to dry put the damp air (a byproduct of burning propane is water) and allow and keep enough oxygen in the air. 5. Choose a sheltered location to park. I prefer to park in the protection of the trees every night in the winter but that isn't always possible. We pay attention to the wind direction and when we can't park surrounded by trees we park somewhere where we are out of the worst of the wind whether that is up against a building or a giant snowbank or a semi truck. I am sure there are a few more things we do to keep warm (like wearing extra layers or drinking more hot chocolate) but these are things that everyone does in colder whether regardless of the size or type of house you live in. I hope you are all as warm as we are in our little bus!